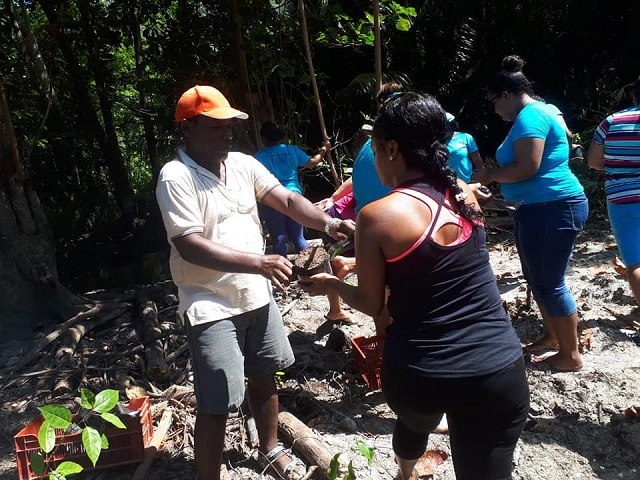 (Seychelles News Agency) - An environmental not-for-profit organisation has planted 7,500 trees on Seychelles’ Praslin Island as part of efforts to prevent erosion and land degradation and to restore mangroves forest. The initiative is being led by Terrestrial Restoration Action Society of Seychelles (TRASS), the only environmental not-for-profit based on the second-most populated island of the Seychelles. For the past couple of years, TRASS has intensified efforts in restoring coastal habitats like mangroves, wetlands and coastal forests. Elvina Henriette, a biodiversity consultant affiliated to the organisation, told SNA on Tuesday that currently seven sites on Praslin and the neighbouring island of Curieuse are being restored. “In 2017, TRASS was contracted to produce and plant mangroves and other coastal plants under the Ecosystem-based Adaptation-South project,” said Henriette. According to Henriette, the organisation was selected for the project which included plant propagation and planting because of its good track record in plant propagation and skills in replanting techniques. 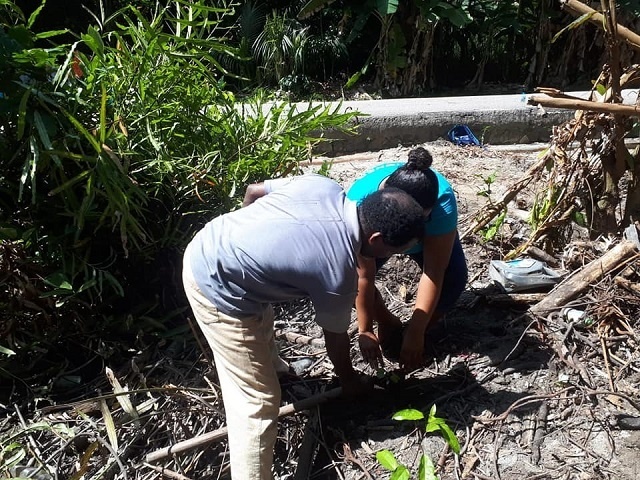 In 2010, one year after it was launched TRASS started to work on mangrove restoration through a project funded by Mangrove for the Future which raised awareness and engaged the community to participate in measuring soil erosion at Anse Possession, in the north of the island. “The project established monitoring of soil erosion from the mountain down the rivers, the mangrove and into the lagoon. This allowed us to confirm the deterioration of mangrove degradation hence raising the need to restore mangrove as part of its mission in the restoration of degraded land,” explained Henriette. All plants being used in the restoration work is produced at the organisation’s nursery at Fond B’Offay, which to date has produced 15,000 plants. Victorin Laboudallon - a founding member of TRASS - said that mangrove seeds are collected on Praslin and Curieuse Island – a protected area. The seeds are transferred into the nursery where they are planted in mud and raised for 4-8 months. After which the mangroves are planted at selected locations. “These locations were chosen out of more than 20 sites because they responded more to the aim of which was basically to adapt to climate change through on-the-ground interventions, such as mangrove restoration,” explained Laboudallon. Five species of mangroves are being used in the restoration. These are white mangrove (Mangliye blan), red mangrove (Mangliye rouz), black mangrove (Mangliye lat), yellow mangrove (Mangliye zonn) and Puzzlenut mangrove (Mangliye ponm). Several species of non-mangrove plants are also being planted these includes Bwa-d-tab, Bwa siro, Fouzer lanmar, Lafous, Bodanmyen. These are planted in wetland areas where mangroves do not grow i.e. areas that are not suitable for mangroves. “Several mangroves are located next to marshes where other types of plants grow and which needs to be restored. Hence other native coastal seedlings are planted in these areas,” explained Henriette. There are seven species of mangroves in the Seychelles – a group of 115 islands in the western Indian Ocean - and not all of them are found in all locations. “The aim of the replanting is to increase the mangrove diversity in other locations as well. For instance, some locations have only two species of mangroves but the site is suitable for other species too. So, TRASS has introduced these species,” added Henriette. Counting on the support of volunteers from both the public and private sector the organisation will soon embark on a project to rehabilitate the Fond Boffay watershed -one of the largest water catchments providing potable water to the communities on the island. “The area is where the hills are bare and degraded and in need of being restored to ensure a continued and healthy water supply,” said Henriette. The biodiversity consultant adds that future projects include the rehabilitation of other water catchments as well as the promotion of biodiversity-friendly sustainable forest and land management practices such as beekeeping, agroforestry and agro-tourism amongst local communities.